Chris Lemmon, like his dad Jack Lemmon, has acted in the movies, on stage, and on TV – including Knot’s Landing and Thunder in Paradise. They were in two movies together: Airport ’77 (1977) and That’s Life! (1986). Jack and Chris shared a love of music, especially music played on the piano. Chris has a degree in classical piano and composition. Jack Lemmon’s musical interests leaned toward the standards. 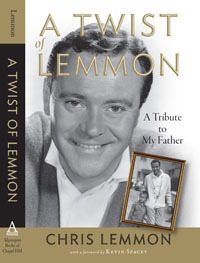 In his memoir, A Twist of Lemmon: A Tribute To My Father (Algonquin Books, 2006; Applause Theatre and Cinema Books, 2008), Chris Lemmon wrote that he decided not to pursue his “musical fantasy” after a very rough-around-the-edges college recital. His “dream of being a twentieth-century Franz Liszt” was over. 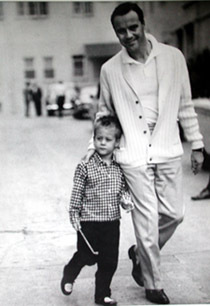 But music served him well, in part because it brought father and son closer together. Can we talk about you and your dad? Sure! I love talking about the old man. Your dad never learned how to read music. And, he was self-taught. What is the learning process, anyway? Self-taught is just another way of learning, isn’t it? He didn’t take the classical approach to a musical technique. However, he trained enormously and sensibly. I’ll tell you right now: the guy had one of the fastest right hands I’ve ever seen. His right hand had the same dexterity as his mouth had – that marvelous gift for gab. My father could move so quickly. The same thing with music. So he was a good piano player? He was a very good piano player. I don’t care if he studied classically or not, the man was a very good pianist. He also liked to sing. I don’t know if you could call that singing. Jack Lemmon could sell a song and he was a very charismatic man. It wasn’t about the singing. It’s all about the performance. I was watching the early films, which are very interesting. I think most people have not seen them. They were popular at one time, less so now. Less remembered now. I was watching him sing with Betty Grable, June Allyson, the great little number with Judy Holliday in the film It Should Happen To You! Did he talk about what it was like singing with those women? He wasn’t one to talk too much about his performances. If he talked about himself it was in order to make himself the brunt of a joke. He was a wonderful raconteur and he loved to speak about things he found funny. And fortunately all of us found them funny, too. But he was also very self-deprecating. He was even more fun to be around in real life than on the screen. When he talked about himself, he usually made himself the brunt of the joke. I think that was one of the facets of his wonderful emotional generosity combined with his true humility. He loved talking, and listening, to people. He was the most emotionally generous man I ever met. Despite the fact that he was Jack Lemmon. Or, along with the fact that he was Jack Lemmon. Was he self-deprecating about his musical abilities? “I want you to sit down and jam with me if you can stand it.” He adored music but he never placed himself on any kind of a pedestal. What kind of songs did he like? George Gershwin was my father’s favorite and certainly one of my favorites as well. Did he have a favorite song? I want to hear about how music brought you together. Because you did have some stress as father and son. For us, the piano became a wonderful mending process. My father and mother [actress Cynthia Stone, 1926-1988] were divorced when I was quite young. I think he reached out in a number of different ways. Basically, to heal the rift of divorce, my father tried a few things. We had yearly adventures together. Music was the way we were able to reach out and cross the gap that divorce had created at such an early age, and the lack of having a father figure in my life for so many years. When I was quite young. I started playing at the age of five, and I’d play piano with him. The music created a bond and a friendship between the two of us that really was one of the most wonderful experiences of my life. Later on [as an adult] I would visit him, too. Inevitably when we were together, if there was a piano around, we would end up at that piano. It enhanced what we had begun with, and what we were trying to repair. I thank God for music. It was a marvelous, transcendent form of communication for the two of us. And piano playing was a refuge for your father. And he let you into that refuge. I’m very happy to say, he adored me. Maybe almost as much as I adored him. We were really very good friends. We enjoyed each other’s company very, very much. And so music was a real icing on that cake – for us to be able to share that together. Golf, too, even though the two of us together may have possibly equaled the worst golfer on the face of the earth. But we adored it. And we certainly weren’t Van Cliburn or Vladimir Horowitz either – yet, we enjoyed sitting down at the piano and playing music together.